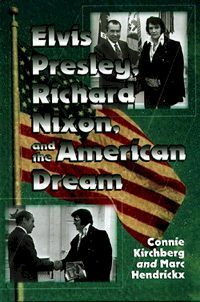 Click on the Elvis & Nixon page to the right for more information about this book, which was first published by McFarland in December 1999. (Sold out.) As with my other books listed here, you can read the first three chapters for free. You may also navigate to my Comcast website via the link below to view some original drawings of Elvis and Nixon, and to read some alternate excerpts. Back in my early, naïve writing days, I thought I had a solid plan: write a good book and a sale to a mainstream publisher would eventually result. I didn’t expect to become rich overnight—or ever, for that matter. What I did expect was for my hard work to net a sale, after which I could write and sell another book, then another and another. My long-term goal was to build a moderately successful career making a living with my writing. I tried to be patient, do all the right things. I took writing classes. I read a truckload of writing books. I read within my genre and outside of it. I joined a critique group. I worked with a freelance editor. I attended writing conferences. I subscribed to writing magazines. I studied the craft, honed my skills, and became a better writer. All of that work did pay off to a point. I sold the two non-fiction titles listed above, both of which were born from personal interests and hobbies. (Write what you know, at least with non-fiction.) I have the satisfaction of knowing my books are in public libraries and prestigious universities like Stanford and USC. Unfortunately, that satisfaction hasn’t helped me reach my long-term goal of making a living as a writer. Two published books from a midlist house means nothing to agents, especially if you’re trying to sell fiction. It’s like saying you worked your way up from flipping burgers to waiting tables. Bottom line, it’s harder than ever to sell a book the conventional way. That doesn’t mean we should quit trying, but it does mean we need to approach the process realistically. Today’s publishers don’t market their authors. Agents can’t afford to take on clients unless they know those clients can generate sales. Doing so takes more than a good book; it takes sound marketing skills and the ability to implement them. Now that I’ve identified the problem, I’m working on a solution. Stay tuned.